Through rapid technological advances, the cost of genotyping and genome sequencing has dramatically reduced over the last 20 years. As a result, they can now be considered for use, not only for academic research, but also for routine use in human medicine, and routinely for research and implementation in both the companion and production animal industries. As the level of use has grown, so has knowledge of how to make best use of the tools available to deliver real cost-effective improvements in areas such as animal health and breeding. As more advances are made there is little doubt that the value captured from using genomic technologies will continue to grow. Edinburgh Genomics is one of the largest sequencing facilities in Europe, and is the leading academic open access genomics and bioinformatics service provider in the UK. It forms a major element of the University of Edinburgh’s service provision and comprises two divisions, Genome Sciences and Clinical Genomics, each with dedicated sequencing facilities. With a wealth of sequencing expertise and a proven track record over more than 15 years of delivering high quality data, Edinburgh Genomics’ highly skilled team of scientists and bioinformaticians, provides high volume data with cutting-edge analyses to a global community of research collaborators and customers across academia, government and industry. 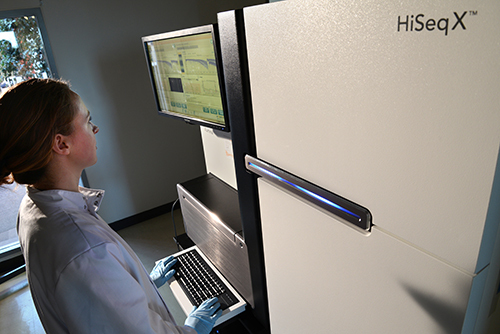 Through a flexible approach to using the latest technologies, together with a sound applications knowledge, the unit can manage a diverse range and size of projects, ranging from genotyping using low density arrays, through to high volume whole genome sequencing with the capacity to sequence more than 10,000 genomes per year to a high density (30X). Genotyping using: Illumina (iScan) and Affymetrix (Gene Titan) arrays/chips. If you would like more information or would like to discuss a possible project, please contact us.